Let’s look, for example, at an electric kettle for home usage. The product’s main Hard-Attributes are more or less obvious – the performance, weight, cost, and main features are all relatively easy to define, as well as to measure and test. Defining the kettle’s Soft-Attributes is a different story – how are its appearance and character defined? Does it need to be robust or feminine? Elegant or “young”? Let’s say that we’ve reached the conclusion that an elegant look is the most appropriate. How do we transform elegant into form, material, and color? Are silver curved lines more elegant than red straight lines? Are delicate details more elegant than “heavy” details? For the Hard-Attributes, the product characterization and the product design relationships are direct and clear. If the product is not strong enough, we should use stronger materials or make a stronger design. If a product is too heavy, we have to reduce materials or components, or use lighter materials. The Soft-Attributes, however, are much more complicated to manage because there is no direct connection between the “problem” and the solution. There are no “rules” of how to make more elegant kettle or a stronger feminine look. The Hard-Attributes are objective – they are above time, place, culture, and personal opinion. The Soft-Attributes are exactly the opposite – they are subjective and very much depend on time, place, culture, and personal opinion. Therefore, these two types of attributes should be managed using totally different methods and with totally different tools. How do you manage a product’s hard and soft attributes in a product design process? Make sure to distinguish between and to separate the two types of attributes. The Hard-Attributes have a Natural-Scientific nature; use Natural-Scientific methods and tools to manage and measure them. 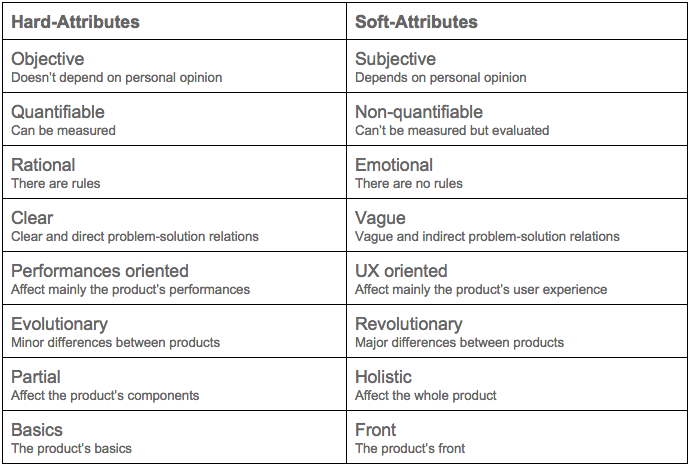 Soft-Attributes are much vaguer and difficult to manage, yet, they are crucial to the product’s success. Don’t rely on solely free intuition for making Soft-Attributes decisions. In most consumer products, the Soft-Attributes become the product’s character and its compelling selling points, so consider them accordingly. Yet, the best Soft-Attributes cannot cover poor Hard-Attributes performances, which are the basics of a product. Hard-Attributes define the product’s “infrastructure” – abilities, performances, and reliability. The Soft-Attributes define the product’s front – user-experience, character, and look & feel. The balance between the two can be different in different products, but any good product must consider them both in totally separate and different manners. This entry was posted in Product Design Management and tagged Product Design, Product Design Management, Product Design Strategy by Yariv Sade. Bookmark the permalink. Good beginning to a discussion. The “soft attributes” can be broken down into style and aesthetics. The style is the overall look which conveys the meaning of the product to the person using it and “fits” the behavior and lifestyle of the person using it. Aesthetics is the sensitive relationships among the physical surfaces and among the qualities on surfaces (color, physical and visual line, shape, texture and pattern and gloss. Indeed, this is the purview of industrial design. When done correctly along with engineering the result is a quality product that relates its function and manufacturer to the person using it and speaks clearly about that user. Yariv, you clearly distinguish the physical performance attributes of the product form the softer experience oriented attributes with this table. The sharp distinctions in the table are, however, oversimplified. People’s perceptions are usually more difficult to measure than the physical attributes, but this does not mean that perceptions are unmeasurable. Qualitative research methods reveal people’s perceptions. For a given group (a population) we can determine preferred over less preferred design directions. Because we can identify preferences for the majority of a given population shows that we can apply a rational, objective process to better understand a subjective phenomenon (like ‘desirability’). Further, the usability of a designed system is something that product designers understand much better than engineers. We have objective methods of measuring what is easy to use and what is difficult to use. So unless you mean that product designers should relinquish the realm of improving product usability (and by extension universal design) to engineers, I suggest that you should modify your table to better reflect these critical design attributes. Philip thanks for your comments. I totally agree with you that industrial designers, in most cases, are the ones who should manage and define the product’s user-experience and usability. Yes, there are methods and tools to deal with product’s Soft-Attributes, and a professional product design process should include such methods (like the one you mentioned). My main message in this article was to distinguish between Soft-attributes and Hard-Attributes. The product’s impact resistance and desirability are very different attributes and treating them evenly is a mistake. The first one is an objective fact, whereas the second one is a subjective fact – it depends on culture, location, age, time and so forth. Soft-Attributes should be managed and measured (or estimated), but you have to remember that the results are limited to your specific audience, time and location, as well as to your measuring method, and this is very different from Hard-Attributes which are “universal”.